“The spirit is willing but the flesh is weak” would be a concise summary of what the French experimental black metal three-piece is doing on its second album Dazzling Dawn. The cover artwork is actually quite cool, and maybe this made my expectations too high, but even lower expectations could make me like this album. Consisting of a male/female vocal duo and one guy in charge of all the music, the band from Dijon wants to cross every possible musical boundary but forgets that this can only work if the actual songs make the transitions smooth. The album starts with the overly long intro The End (alas, it’s only the beginning!) before the title track offers fast paced black metal with a certain Celtic Frost sensitivity. This would have been a great song, were it not for the abysmal production that lets everything sound like a demo tape cheaply recorded in someone’s basement. The following Sophist Revenge can still trump with good songwriting, but the female vocals sound just too wrong. At least the lead guitar has some truly brilliant moments. From here on, things get even worse. The next two songs try to inject some gothic elements but eventually are not able to combine them smoothly with the metal parts, and don’t let me lose another word about the vocals! Next up are two (!) instrumentals that finally rob the last bit of momentum that may have been there. Two more regular songs may reconcile the diehard metal faction, but then the album closes already with a ten minute long soundscape that might have been nice on an experimental ambient album but under the circumstances only seems to artificially increase the album’s length. The non-metal instrumental tracks make for twenty minutes, so that we are left with only half an hour of regular music, and even those can’t really convince. 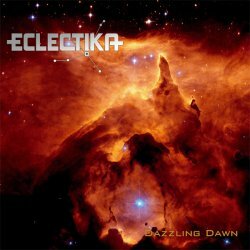 I am not denying that Eclectika have some good ideas, but maybe next time they should invest the money not into a great CD booklet but rather into a professional producer that helps them to implement their ideas and give them a listenable sound. They way things are, you have to be really quite undemanding to find much to appreciate on Dazzling Dawn.